Join the crowd! The Home Instead Senior Care Foundation has created the GIVE65 crowd fundraiser exclusively devoted to help non-profit organizations raise money geared towards caring for seniors. GIVE65 is the first of its kind for Home Instead Senior Care and was created to raise money online for programs and services related directly to helping seniors and creating hope for them. Home Instead is expecting it will be a catalyst for social change and we will continue to see fundraisers like this for seniors in the future. The GIVE65 event is a 65-hour online charitable fundraising event aimed at inspiring greater giving to non-profit organizations serving seniors. It will take place from July 12-14, 2016. During this time a limited number of approved, participating organizations compete for up to $100,000 in matching grants and are also eligible for one of two $10,000 financial rewards which recognize outstanding small, medium and large-size non-profit participants. Wondering how you can join the crowd and help make a difference for seniors? Beginning July 1st, you can schedule your 100% tax deductible donation to be given to an approved non-profit of your choice during the fundraising event July 12 – 14. By scheduling it in advance, you ensure the organization of your choice will receive your donation during the event time period and it also may be eligible for matching grants and financial reward prizes. Home Instead Senior Care Minneapolis is proud to exclusively support the Park Nicollet Foundation, who applied and was carefully selected to be a recipient of donated funds during the GIVE65 crowd fundraiser. The Park Nicollet Foundation is located in St. Louis Park, Minnesota and for over 40 years has partnered with schools, nonprofits, community organizations and the local government branches to solve complex issues in the community including health concerns of seniors. The Park Nicollet Foundation is the philanthropic branch of Park Nicollet Health Services which supports hospitals and clinics and a variety of community programs in Minnesota. By donating to Park Nicollet Foundation you are helping them continue to live by their mission of improving the health and wellbeing of their patients, families and communities, right here in Minnesota. The Minneapolis area senior population needs our help and your donation to Park Nicollet Foundation through the GIVE65 crowd fundraising program will help. Lori Hogan, Home Instead Senior Care Foundation Vice President says “The need is great. I think GIVE65 is a rallying cry for all of us – the public and private sectors – to come together and create hope for our seniors in need.” Home Instead Senior Care understands the challenges faced when raising money for social service programs that focus on seniors in need and believe they can lead the charge in charitable giving and inspire others to work together towards a common goal. Programs like GIVE65 are important to our local communities as the senior population grows, non-profits need financial support to maintain the programs and services they provide that give hope for seniors. Every gift will make a difference – from the minimum donation of $10 to the larger donations. Those who want to help our local seniors, including businesses, corporations and other foundations, can visit GIVE65.org to invest in the growing Minnesota senior population. And don’t forget to save the date! Beginning July 1, 2016, you can schedule your GIVE65 event donation to ensure your donation will be given to the non-profit of your choice during the fundraising time period. Together we can make a difference in the lives of the seniors in our local communities! Much more than a case of the “winter blues”, seasonal affective disorder (SAD) is a medical condition, a type of depression. It affects many people who live in northern states like Minnesota, in the late fall, winter, and early spring due to the lack of sunlight during these seasons. The Mayo Clinic defines seasonal affective disorder as a type of depression that is related to changes in seasons – SAD begins and ends at about the same times every year. SAD is diagnosed more often in women, but men tend to have more severe symptoms. Most people with seasonal affective disorder feel the symptoms beginning in the fall and continue through the winter months, affecting their energy levels and overall moodiness. The good news is there are treatments to help fight this condition! One is the use of a SAD lamp so, to assist our Minnesota clients and CAREGivers who are affected by this disorder, Liberty Oxygen and Medical Equipment is offering 30% off all SAD lights during the month of January. One of the methods of treating SAD is with light therapy, also called phototherapy. The therapy is provided through use of a light box or SAD light, which a person sits within two feet of for thirty minutes per day – typically first thing in the morning. The SAD light (also called a SAD lamp) emits a bright light simulating sun light, and should be a minimum of 10,000 Lux (metric measurement of light intensity). The light stimulates a receptor in the eye that in turn causes a chemical reaction in the brain linked to mood, and is believed to help reset your circadian rhythms. Sometimes referred to as happy lights, the SAD light therapy works for people with mild to very severe seasonal affective disorder. SAD light therapy is typically covered by most insurance companies, if the individual has a diagnosis of SAD, and a prescription for light therapy from their doctor. Also,the light box must produce 10,000 Lux. Insurance companies tend to rent the light box for the first two months, and then purchase it if the therapy is successful. Contact your insurance company for specific coverage criteria – coverage may vary. Many people purchase light boxes at their own expense because it makes them feel happier and more energetic in the winter. A doctor’s prescription is not needed to purchase a light, unless you want an insurance company to pay for it. Liberty Oxygen and Medical Equipment provides light boxes for purchase or rental at all eight of our Twin Cities metro locations and we are a provider for most insurance companies. So don’t miss out – take advantage of our great sale which features brands such as Carex & the Litebook Elite. During the month of January, Liberty Oxygen is offering 30% off all SAD lights. If you have questions on seasonal affective disorder or SAD light therapy, contact us today. Our knowledgeable employees can help you determine if this type of therapy would be good for you. To wrap up our series on preventing hospitalizations, we’ll focus on ongoing prevention and will continue to offer resources. In the previous two articles, we learned ways to prevent hospitalizations and risks to watch for. Many are basic, good-to-know ways to live that will help keep your senior loved one healthy and out of Minneapolis hospitals. In January, we informed you of a survey conducted by Home Instead, Inc., which indicated the problem of preventable hospitalization of seniors is viewed as very to extremely serious by nearly 75% of the North American nurses surveyed who specialize in senior care. Those same nurses estimate that almost half of senior hospitalizations (48.5%) could be prevented with early detection and intervention. In addition, the survey reflects the critical role that families play when helping to keep their aging loved ones healthy and out of the hospital. In fact, 99% of the nurses believe the role family plays, is as important as the role played by health care professionals. In the February article, you learned of some top warning signs along with health and lifestyle risk factors that could place seniors significantly more at-risk of hospitalization. Skipping health maintenance and not having anyone checking in on the senior adult ranked highest for warning signs, according to the nurses surveyed. Home Instead also discussed some common actions by aging adults that can help keep them out of the hospital. Not waiting too long to see a doctor or ignoring symptoms, along with staying active, both physically and mentally were two of the most common positive actions aging adults can do to prevent unnecessary hospitalization. 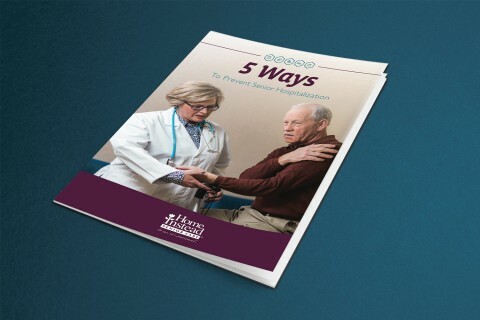 Home Instead, Inc. introduced their 5 Ways to Prevent Senior Hospitalizations guide, along with the Hospitalization Risk Meter in the previous articles as resources. The goal of the guide is to strengthen the role families can take in hospitalization prevention, and to help them feel more confident about actions they can take to keep their senior safe at home. Another tool available from Home Instead is the Hospitalization Risk Meter. This easy-to-read guide teaches you about various warning signs along the way. The risk meter also has resource links on each page to learn more about potential risks and ways to prevent senior hospitalizations. To complete the series, we’ll focus on ongoing prevention and provide additional resources, like the “Senior Routine Tracker” to keep your loved ones healthy. Watch this video to learn how to prevent senior falls with assessments and balance exercises. Another important factor in preventing unnecessary hospitalization is following doctor’s orders. Two in five nurses surveyed (43.5%) said the easiest step that seniors can take to help prevent hospitalization is to follow their doctor’s orders. The surveyed nurses estimate that 47% of seniors put off their medical appointments or have problems accessing medical care. And, one of the most common barriers (89.5%) that prevent seniors from complying with doctor’s orders is their willingness to change their ways. The next most common barriers are dementia/Alzheimer’s (88.8%) and denial of health issues (86%). All of these barriers can be broken down and caring for your aging family member would be much more successful with the help of loving family. If the aging adult has loving family checking in regularly, ensuring they attend their doctor appointments and are following doctor’s orders, the outcome will be successful. To help the family members feel confident in the care for their loved one, Home Instead offers another resource in the web-based ‘Senior Routine Tracker”. This easy-to-use routine tracker will help the family caregivers tune into the habits of their senior loved ones in an effort to help them avoid the risk of being hospitalized. The goal is to keep our loved ones healthy and at home. Hospitalizations can be prevented and with the assistance and instructional resources available to the caregivers from Home Instead Minneapolis, hospital stays can be minimized. If a family member is not available, home care services can help bridge the gap. Utilizing resources like the Senior Routine Tracker, 5 Ways to Prevent Senior Hospitalizations guide and the Hospitalization Risk Meter will help you better care for your aging loved one, keep your senior healthy and home instead.